Heh... Yeah... My opponent is a top chap though, he's not competetive at all (for example his main army is a beautifully converted Ork force and for psychic powers he rolled on Telepeathy because he was just working through the disciplines!) and was just like "Welll.... It's a thematic loss!" I blame you and Skimask for me building talons , thanks for the interesting write up. GOOOOOD. GOOOOOOOOOOD. LET THE EMPEROR FLOW THROUGH YOUUUU! No problem. We move to 2k for June and July, so I think I'll get my Tribune built and a few more Banana boys. In an ideal world 2K would be what I have + Tribune, transport, shooty tank and a Sisters Transport or something. 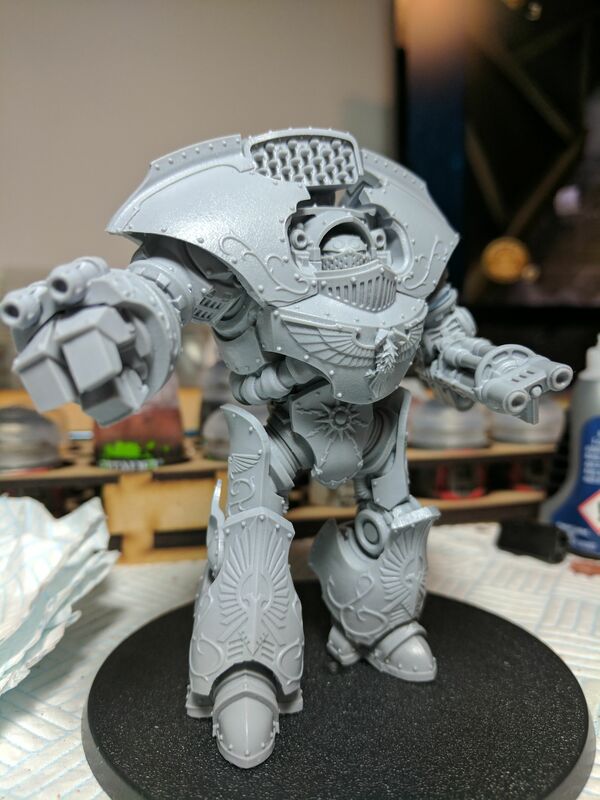 Though I'm at WHF tomorrow with the express intent of getting a Telemon Heavy Dreadnought. Edited by Charlo, 26 May 2017 - 09:31 AM. Well I'm actually going to have my first game today with a full talon list, 2500pts. It's not fully painted much to my shame, but it should be done...relatively soon. I'll let you guys know how the game goes! Been a month huh? Damn...! 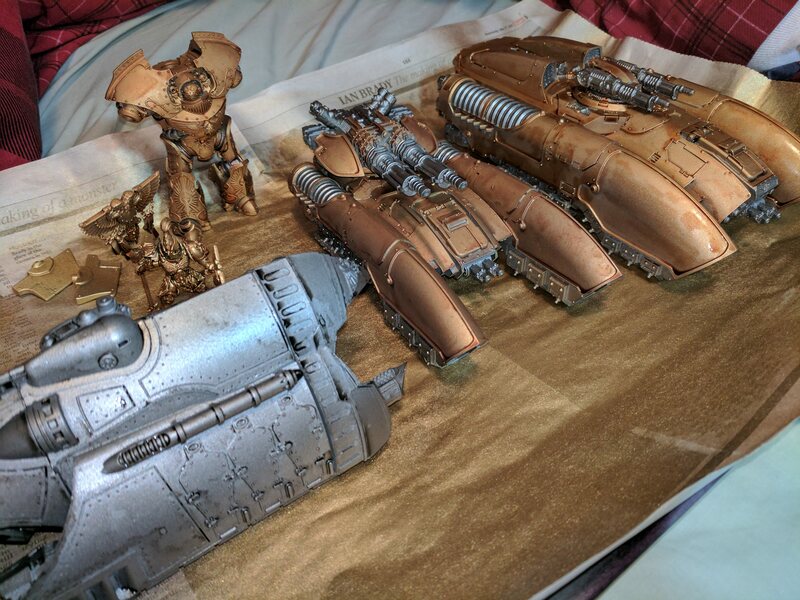 Sadly been a bit busy to even take them out of the boxes yet, but I'm vowing to get them done by the end of July to at least a built and gold/ wash state so I can use them in the escalation league for the 2nd 2K game. Edited by Charlo, 29 June 2017 - 12:19 PM. THRONE OF SKULLS IN AUGUST! 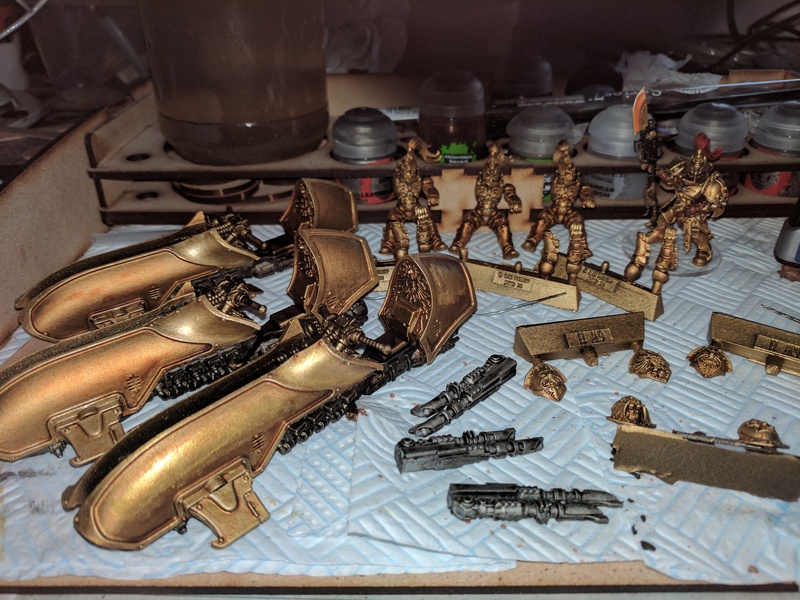 Image is a bit grainy because it was actually taken in low light with the flash, as it made the showed the reflective properties of the gold off a bit more! Edited by Charlo, 18 July 2017 - 10:31 AM. Got the reds, & leather on. 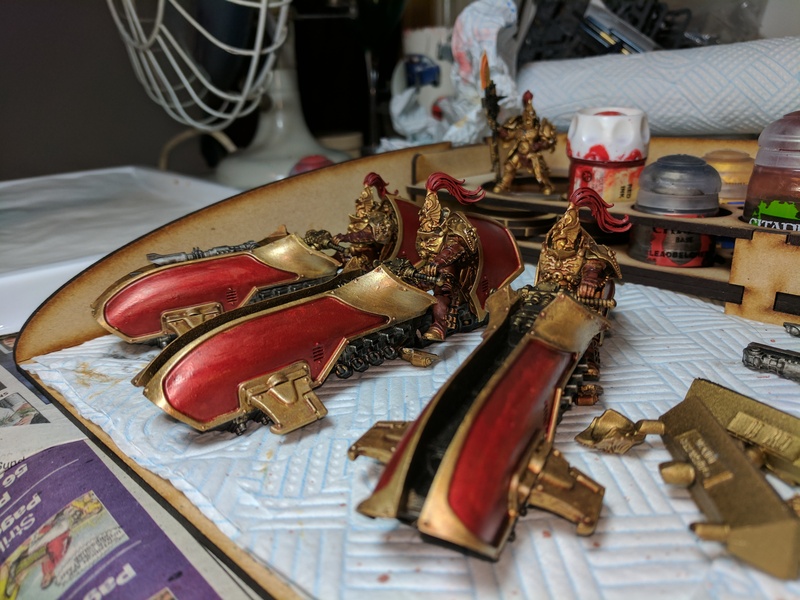 Just a few highlights and details to go now! 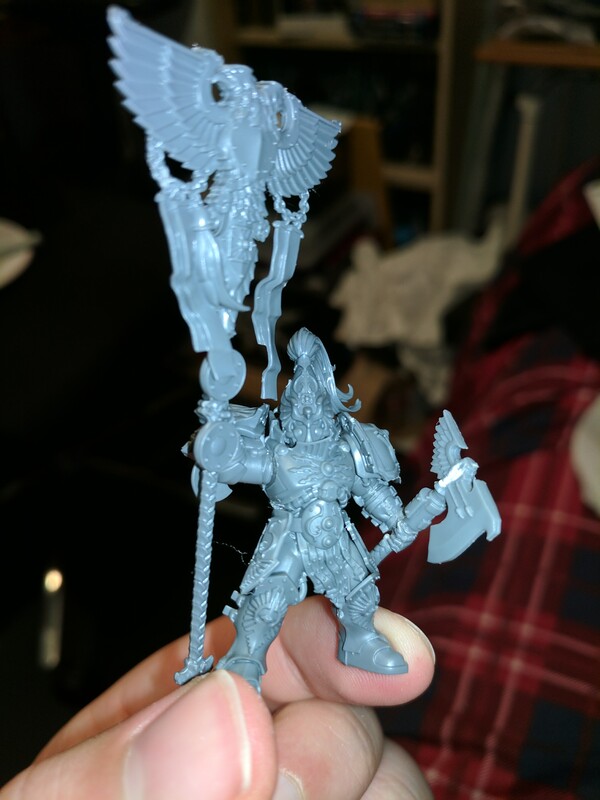 So, with the Aquisitor on pre-order today I am super happy as it means I'll be able to field it for Throne of Skulls! .....Lots to do in just under a month in which I am otherwise quite busy! Edited by Charlo, 25 July 2017 - 10:12 AM. Some nice big house bricks for the 10,000! 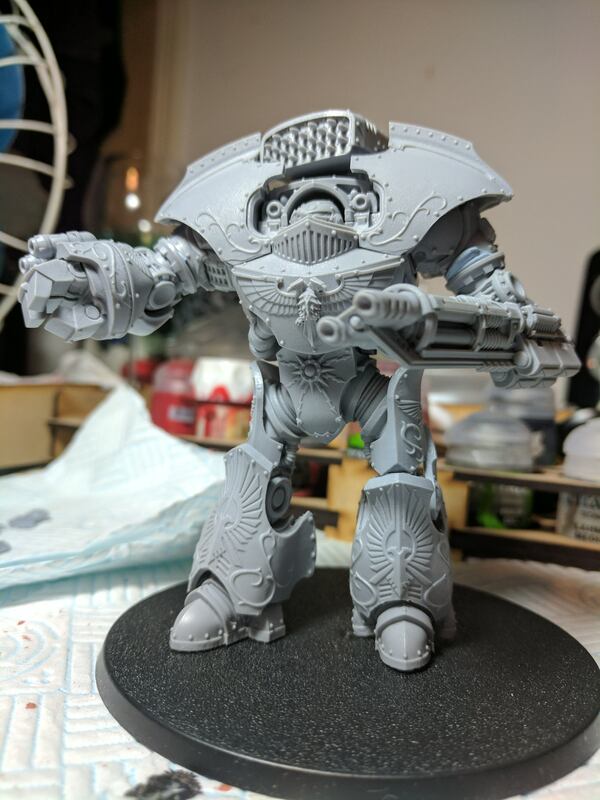 First time building anything bigger than a dread in Resin, came out pretty well! 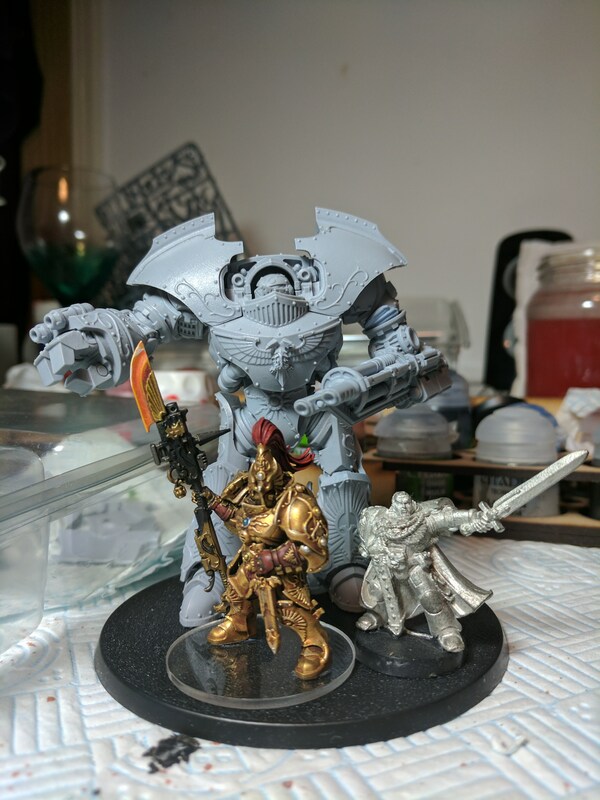 Going to pop the Telemon and if I have time a Vexilla Custode together tonight ready for a game tomorrow against the malicious WORD BEARERS. Mentally wishing you success mate! Edited by Charlo, 25 July 2017 - 10:40 PM. Nah I wanted him to be fairly static, just bracing to let off a spray of plasma while the storm cannon pew pew's from his other arm. Galvorbak with a 2++.... That's all I'll say. ....But the Chaos God's are fickle masters! His little book of names failed 3 times in a row so Krole managed to absolutely clean up some Gal Vorbak before eventually being sliced up by a Blade Slave. At one point she made 4 4++ at once then tore apart 3 of the daemons with one mighty swing. The Telemon is a lot of dakka. 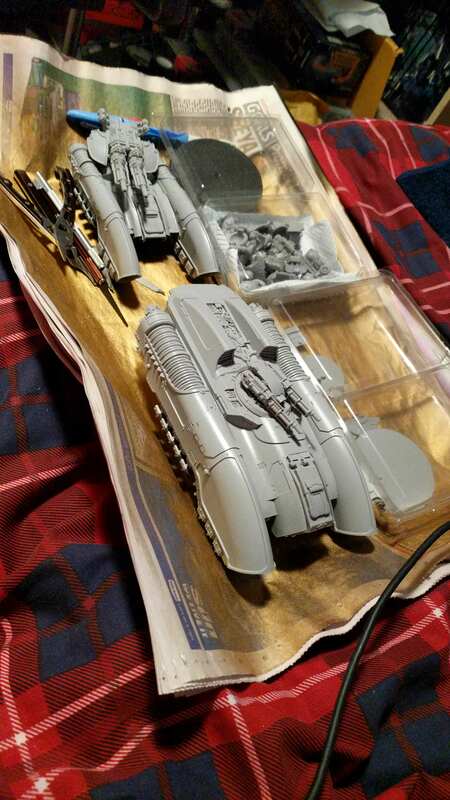 So much dakka. 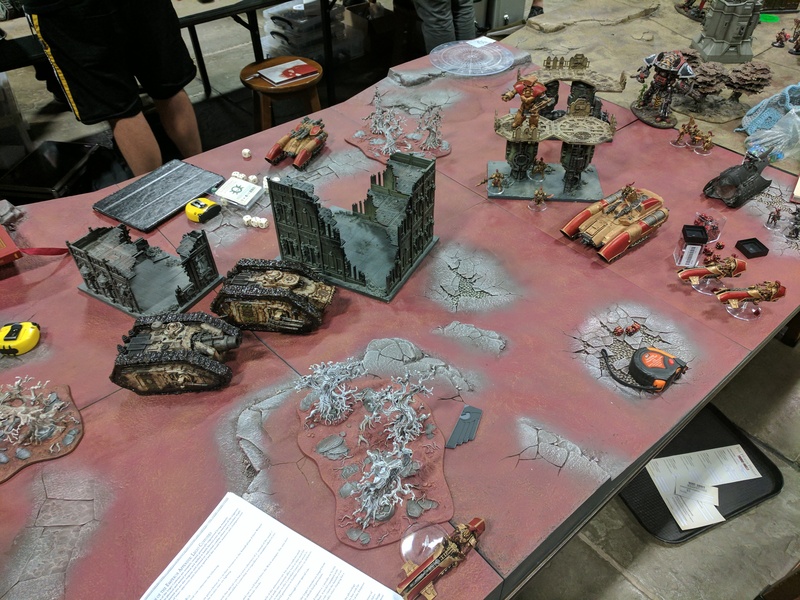 Eventual Tabling of the forces of Chaos after the gods abandoned him. Edited by Charlo, 26 July 2017 - 09:42 PM. Did a crap tonne of spraying last night and just did the rest of the base colours and Reikland wash today. 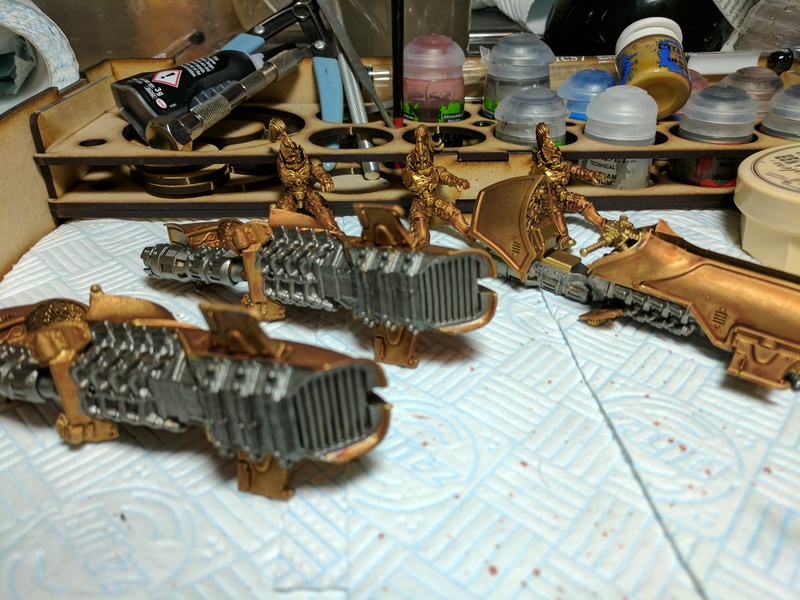 I will have one evening to get these to a table top state. Any updates? Love seeing your photos and progress by the way. Why I'm glad you asked! Thanks for the boost! I managed to get all of the red ink down last night. 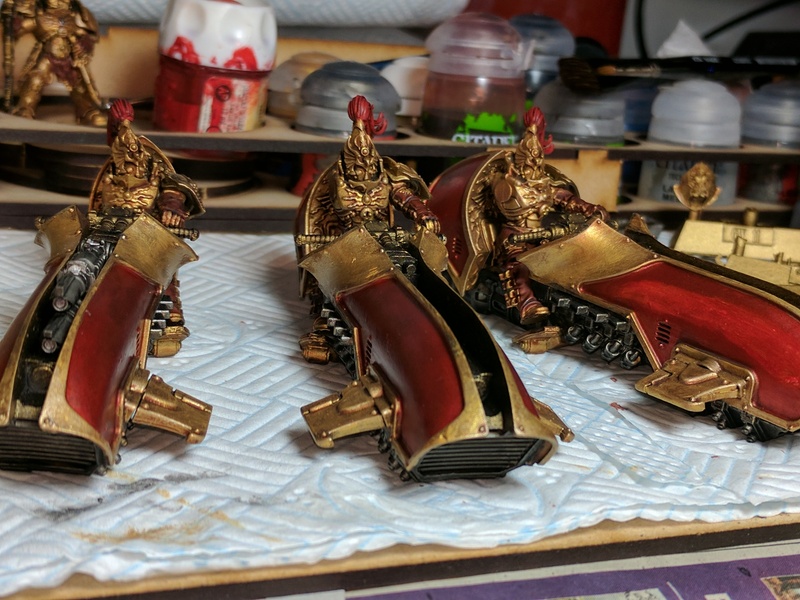 Just need to Nuln the silvers and then i'll be ready for THRONE OF SKULLS at the weekend! Edited by Charlo, 17 August 2017 - 01:53 PM. The Telemon is a beast. Ready for the battles to come on Angelus Minor! Good luck at Throne of Skulls. In the end I placed 35th out of over 70. And that is with my first game being a bit robbed from me. Had an overall really great time and will do a full write-up when I'm not on a train! Look forward to it. And all the cool pictures that you took. 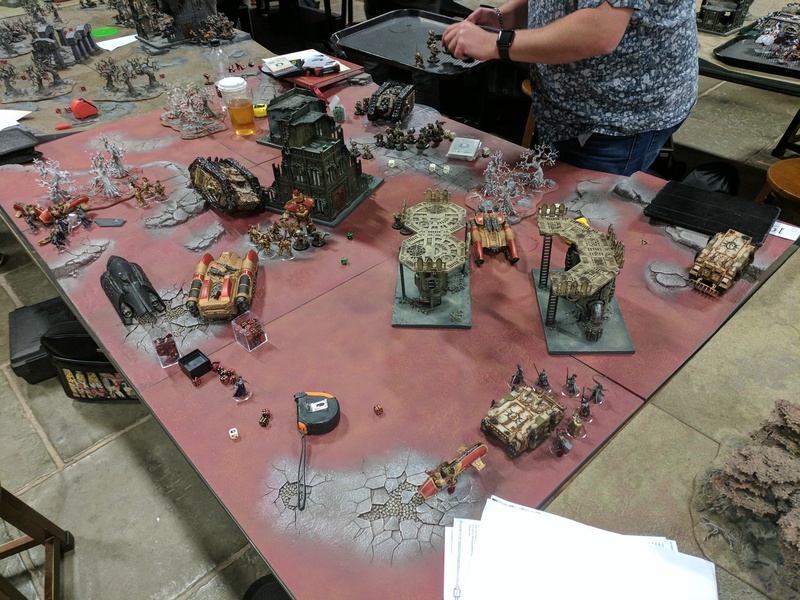 SO here we are, my review and write up of my first Heresy Event... The result is quite obviously that I had a blast and met some great guys and played some "interesting" games to say the least! Lots of players - 70+ in total! 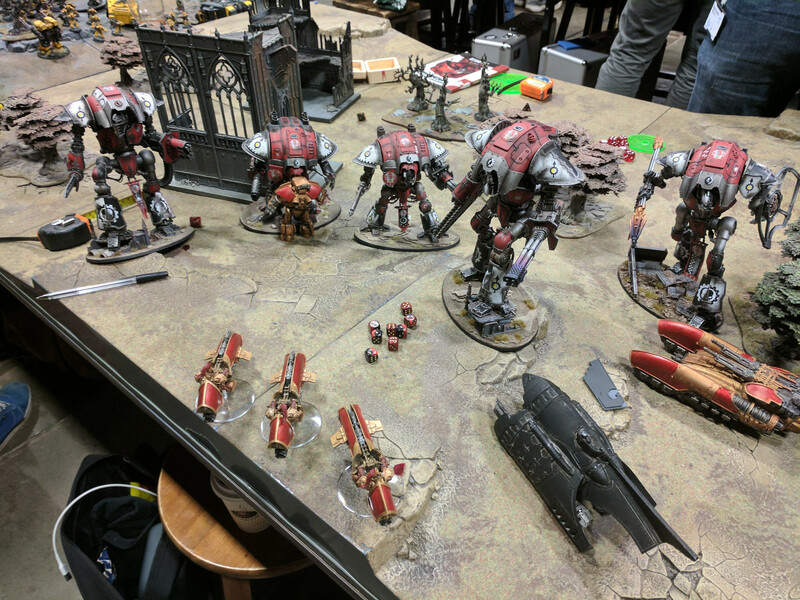 Huge Army Diversity - every possible force from the Heresy on display except for maybe blackshields, but I might have just not seen them! 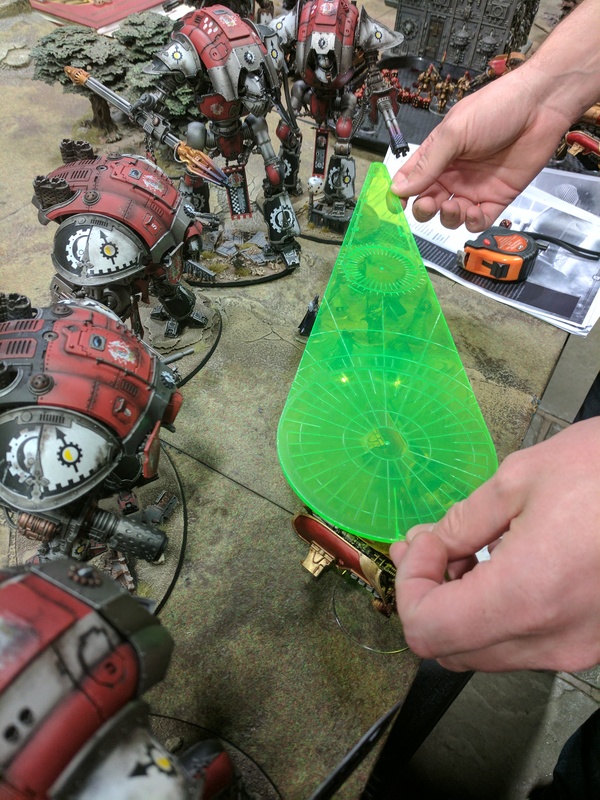 Warhammer World - Bugmans, Beer, Forgeworld store & the ever so slightest whiff of body odor. Drink it in! Always fun to visit. "Free" Lunch - I didn't realise these and had to cancel my food order on day one... Ooops! Great atmosphere - 99% of people were friendly and total heresy heads. All walks of life too which is awesome, one of the best things about the hobby is it's inclusiveness when done right. Price - £70 for 5 games and some staff canteen lunch is still a bit much, really. £15ish per game? Off-putting for sure. Organisation - while everything worked, the event wasn't really run much. They just said which mission to play and did the pairings randomly. 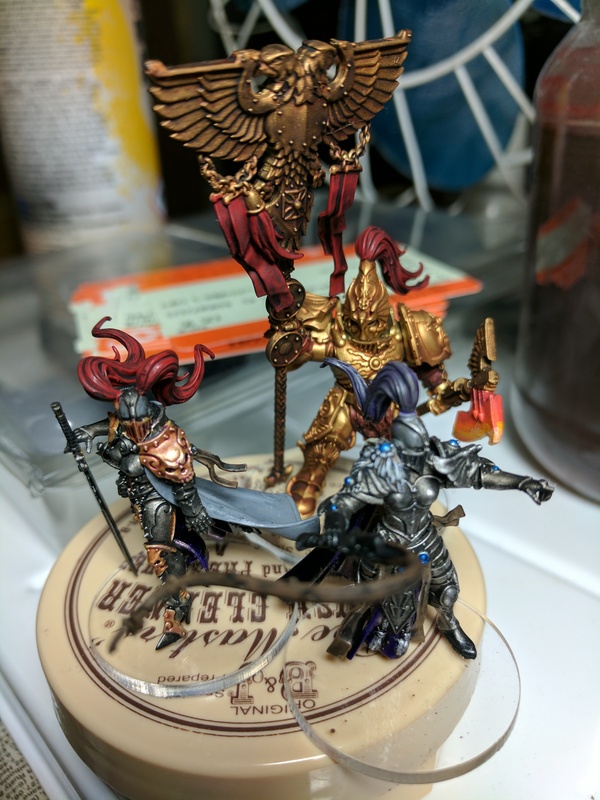 The event only extra objective was also pretty bland and only really an excuse for an admittedly awesome painting/ modelling comp. Basically, it could have been done anywhere but anyone for "free". Factionless - not huge, but it would have been nice to at least ensure I was fighting traitors. Though I'm not fussed because it meant game 5 was EPIC. No narrative - while certainly not billed as a narrative event, the name "Assault on Angelus Minor" meant nothing and you weren't fighting for anything but VP. Could have certainly done with at least a briefing and a few extra rules. Y'all know my 2K list from before and it was pretty much just that! I can't really remember all the missions but will describe as I go. 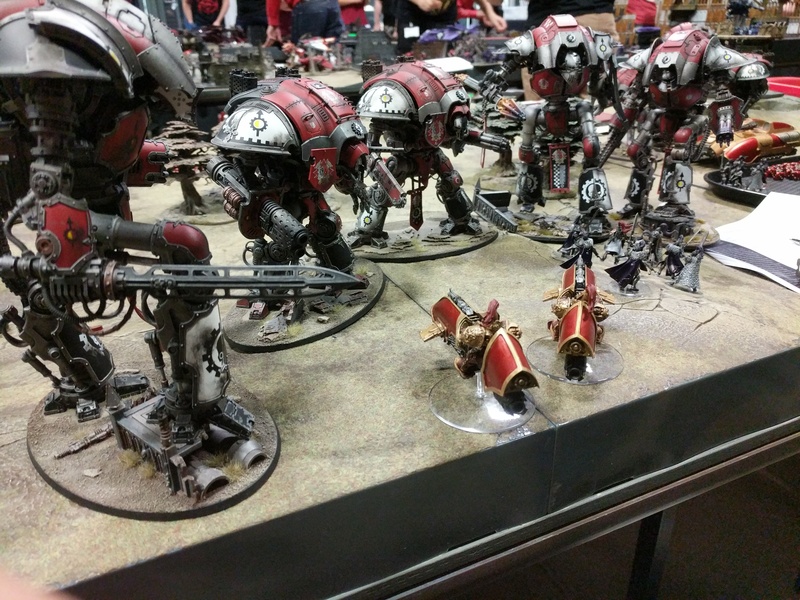 First match was against a guy called Ben and his stunningly beautiful Knights. 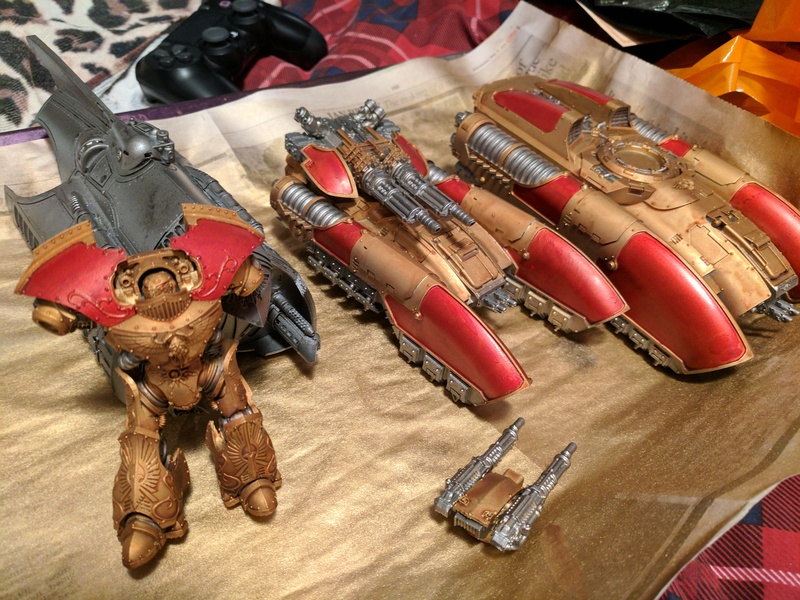 Really awesomely painted and a joy to look at on the table. The bases even basically matched it! A nice mix of Cerastus and Plastics. To be honest, I wasn't that mad I was against Knights for the first match. This is the HERESY and anything goes. The more savage the better eh? Suffice to say it did not end well... I believe the final result was 2 to 28VP, because I held 2 Objectives at the start of my turn 1 it was Dominion or something, basically hold points to score as the game goes on. I did manage to get 3 Knights down to 1 or 2 HP each, but alas it was not enough. The Telemon almost went on a horiffic rampage through them but alas some poor rolling made it not so. Ben was however a top chap and I actually had a LOT of fun getting stomped (literally - he murdered my Hetaeron and Event model with one) into the dirt. He bought me a pint around the time of the second picture to make up for the current situation too 11am drinking kids! Mission was getting units into your own/ enemies DZ and also scoring No Mans Land. A few secondary objectives too. Yes it was a Spartan full of Cataphractii, Preator, Chaplain, Mortug and a Thyphon to start. Two Tacs in Rhinos in reserve otherwise. 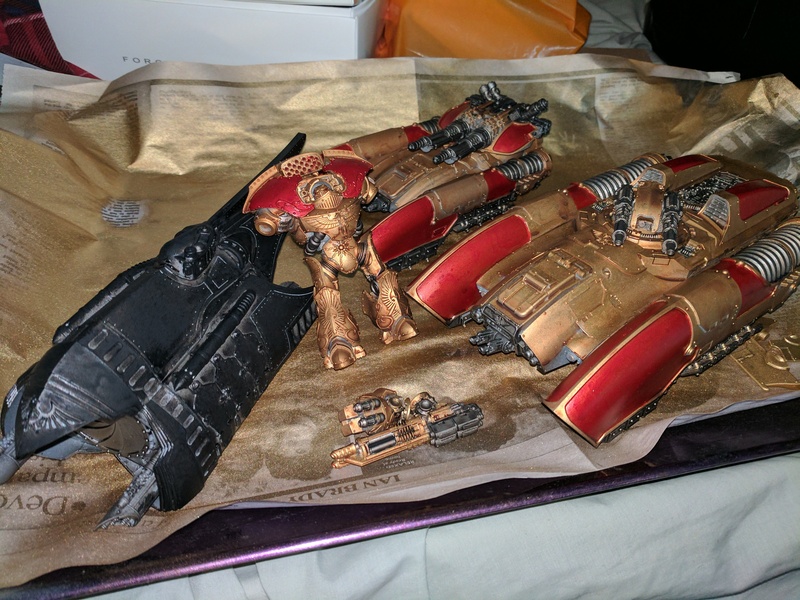 After a few turns I manage to whittle the Thyphon down with minimal casualties and the Spartan disgorges into my Spear Custodes and Telemon. After much deliberating he opts to go for the Telemon with Combi-Melta but Multi assault the two targets - cheeky! 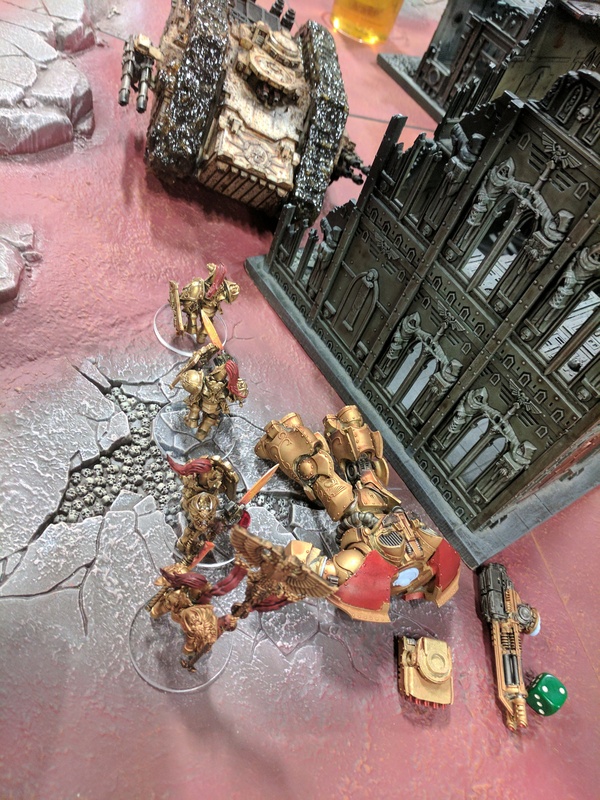 Luckily the Telemon weathers the storm (lots of whiffed chainfists thank god) and straight up punches out a few terminators into the next world. A trend that continues on into the battle. 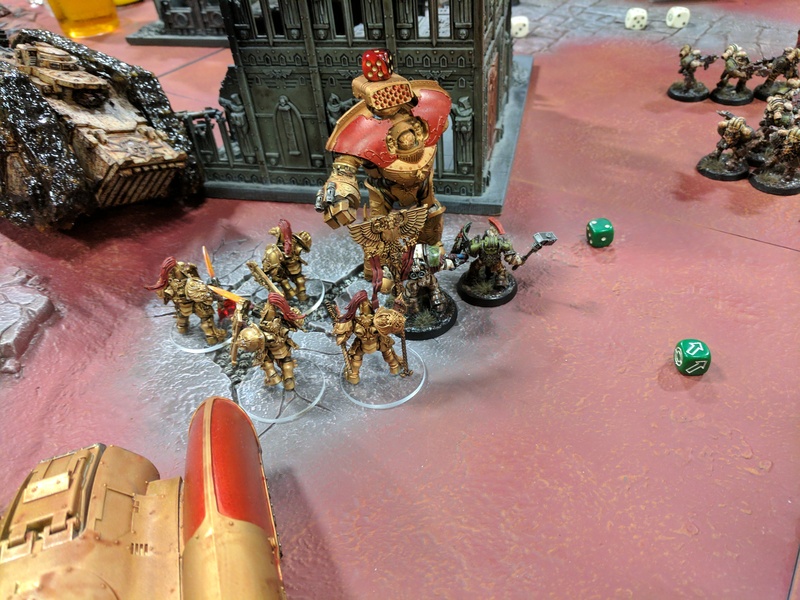 The Spear Custodes fall but the Hetaerons soon replacement, masterfully crushing the remaining DG with help from the Telemon. Sisters make it through the bolter fire for Krole to pretty much decapitate an entire Tac squad alone as they foolishly charge her. But the Telemon finally exits melee to be felled by a point blank lascannon... 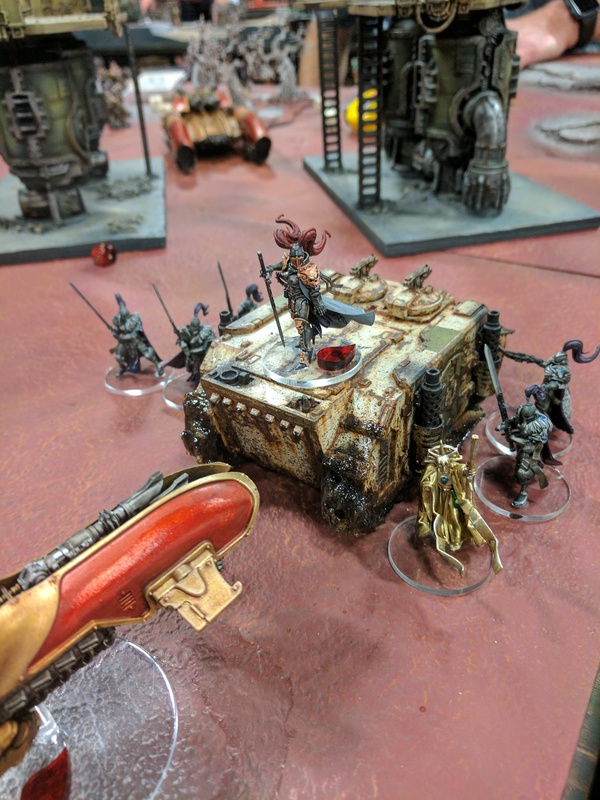 The Hetaeron mourn their fallen comrade while one tries (and fails) to punch open the Spartan lots. 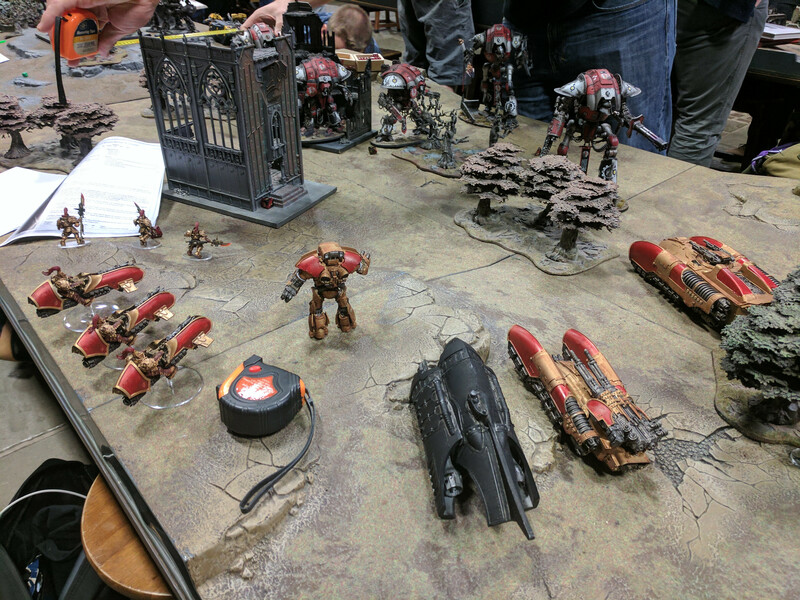 Even though Dave only had a Spartan and his event mini left - we actually Drew on VP as TANKS were socring and Custodes vehicles are not Tanks so couldn't deny him the mid field... 5VP all! A solid, tactical game and a joy to play with a big scrap in the middle. Edited by Charlo, 21 August 2017 - 09:48 PM. When is part 2 coming? I am interested in reading about your experiences at Throne of Skulls (which is getting really poor converge on the internet). Also nice Avi when are you going to join your Barbarus brothers in this subforum? Be interested to see what others said! I can see how some might think it was poor though.